Senior Mary Fran Howard describes the winter 2016-17 season for varisty fencing as one of rebuilding. With the graduation of 13 fencers last spring, the squad looked to this year’s eight seniors to lead the charge. Among them, Landon Braemer set the pace for boys’ saber, winning 26 bouts. Luke Solondz was also strong on saber, posting 17 wins. In addition, both sabrists advanced to the individual rounds in the Prep B tournament. Patrick Reilly headed up the epee squad, enjoying a solid season with 20 wins, and Jack Riccardo led the foilists. On the girls’ side, Nichole Morley did a fantastic job leading the epee squad, while Howard headed up the foilists and Rachel Richardson the girls’ saber team. Boding well for next season, juniors Nicholas Bhimani for the boys’ squad and Jessica Abowitz for the girls’ team both posted winning records in epee. Looking ahead for the program, the team captains noted that all of the sophomores and freshmen worked hard this season. "Many of the underclassmen also fence outside of school. Barrett Reep '19, for example, competes almost every weekend in epee. Working with a fencing club typically involves fencing late at night and having to travel," Howard offered. "It really showed their commitment to the sport and the team." 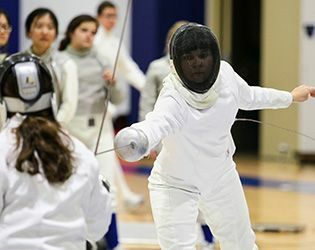 That hard work paid off, as five of those fencers medaled at the Montclair Frosh/Soph Fencing Invitational: Brianna Moglianesi '19 (silver medal in the sophomore women’s epee); Harkanwar Chadha '20 (silver medal in the freshmen men’s foil); Edith Brazil '19 (bronze medal in sophomore women’s saber); Mark Rusas '19 and Alex DeRing '19 (tied for bronze in sophomore men’s sabre). The team rounded out the season with a strong showing at the Prep B tournament, with the girls' epee squad finishing in third place for the fourth consecutive year and boys' saber also finishing third.